London might be cold, gray, wet and miserable. 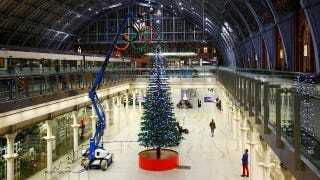 But at least it has a giant Lego Christmas tree to cheer up its inhabitants. Standing proud on the ground floor of St Pancras International station, this 12.2 meter-high Christmas tree is made exclusively from Lego bricks. Well, save for some elements of steel which support its heavier branches. But that's good enough for me. It has 172 branches, and is covered in over 1,000 Lego baubles. The whole tree has taken two months — two months! — to build, and uses over 600,000 bricks. That is a lot of Lego bricks. It's also a very long time, and means that none of us are going to be able to rush out and recreate it before 25 December. Not even if you happen to have half a million pieces of Lego scattered around your house.